One of my husband’s favorite foods is a steak. He can have a steak any day if you ask him what he wants for dinner. And truth be told, I also think there is nothing like a rib eye steak perfectly cooked on a cast iron pan or a grill. I don’t crave it as often as he does but it is tasty, if done right. But I admit, I didn’t exactly know how to cook a perfect steak that was foolproof. Steaks would come out perfect sometimes and other times, so-so. We were already eating grass fed and finished beef so I knew it wasn’t the quality of the meat but I wondered it was the cut or where the meat came from. 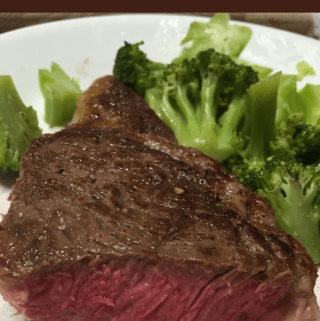 Well, I found out, after reading Anya Fernald’s cookbook, “Home Cooked” (Amazon Affiliate), my inconsistent steak results were due to my cooking method. You see, Anya Hernald knows a thing or two about meat because she co-owns Belcampo Co., a grass fed and finish meat ranch company in CA. Anya Fernald’s connection to food started when she was young. Fernald knew even when she was in college, her career would involve food. So after graduation, she received a fellowship to spend a year working in cheese dairies in southern Europe and northern Africa. While she traveled, she learned to eat. A lot of what she cooks now come from what she learned from watching farmers eat simple food in their homes so when she wrote Home Cooked, her knowledge and style of cooking reflected her early days in Europe. When she moved back to the U.S., she became involved with various food related organizations and eventually co-founded Belcampo to raise healthy, happy animals that are grass fed and finished to be sold in their butcher shops and restaurants. The farm raises animals in open land with ethical and sustainable practices. The animals are fed with food grown in rich soil and are processed and sold in their stores, restaurants, and resorts in CA. You can read more about their practices here. 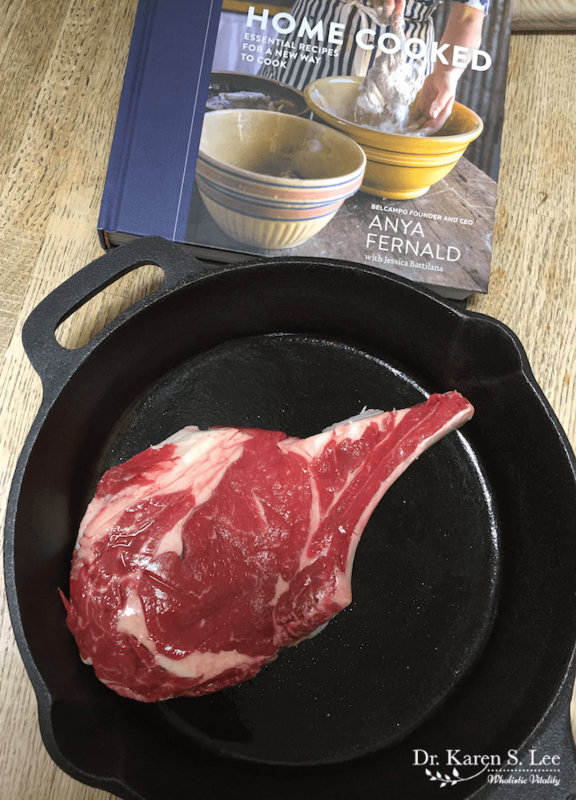 I like Fernald’s latest cookbook because she not only illustrates her philosophy of using fresh ingredients but she uses all the parts of an animal – nose to tail – in her recipes. She allows you to respect all of the animal through her recipes. Ironically, the cookbook has a lot of non-meat recipes but I do love her knowledge on meat. She offers a lot of info about animals for food, which makes you appreciate what you’re eating. Now, finally, her directions on how to cook a perfect steak. Rib eye or NY Strip is what she recommends for a great steak but, personally, rib eye beats any cut of meat for a great steak, hands down. You can’t get this beautiful marbled fat on other cuts. And I think the fat makes the meat really tender and the taste can’t be beat. After you cook both sides, she recommends searing the edges for total of 2 minutes. Use long tongs for searing meat on a hot cast iron pan so you don’t burn yourself. Don’t ask me how I know this. We like our meat, medium rare. You may feel uncomfortable with such pink/raw inside but with grass fed meats, there is less chance of E. Coli compared to grain fed. But still, if you want the steak to be medium, cook 1 minute more on each side. Fernald recommends doubling the times but I think that’s too long. You meat will be well done if you do and in my opinion, you might as well eat a beef jerky if you like leathery meat. 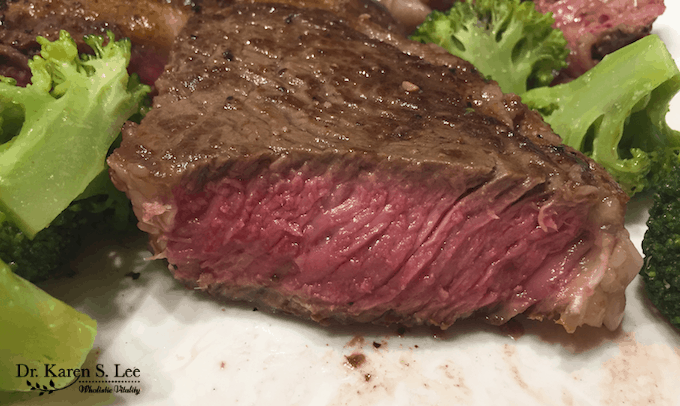 Bone-in-rib-eye or NY strip steaks are the best and the below technique will work well on steak cuts that are maximum 1 1/2 inches thick. This instruction is for Medium-Rare. If you are looking for Well-Done, double all the times suggested below. Take out the steaks in the morning and rub with salt. If you are unable to get the steak salted and to room temperature the slow way, put it in a plastic ziplock bag and run warm water over the meat for 15 minutes, then, salt it. Put the cast-iron pan on the hottest burner and let it sit on the heat for at least 3 minutes and up to 5 minutes until it's screaming hot. 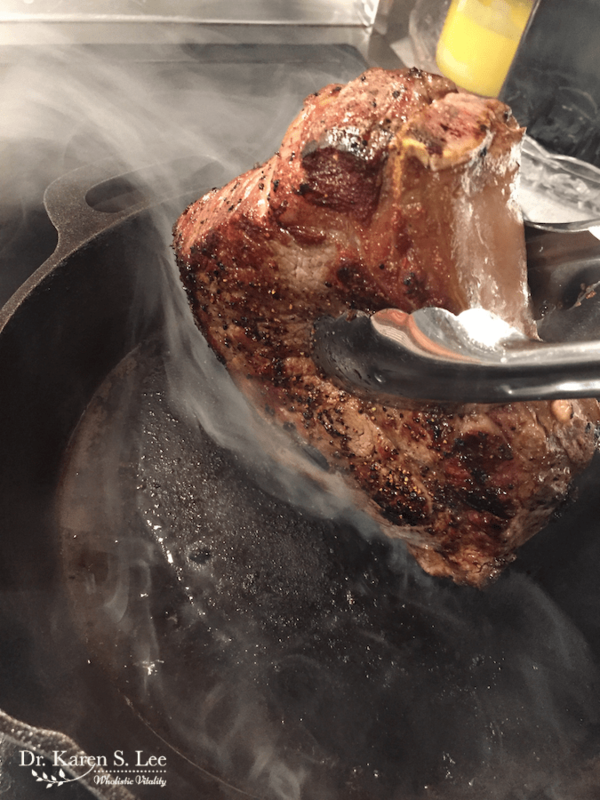 When the pan is hot, add the steak and sear for 2 minutes, 1 minute on each side, and - holding the steak upright with your tongs - spend about 2 minutes more searing all of the edges of the steak: the fat cap, the bone, and any red exposed flesh on the sides of the steak. From this point on, I tweaked the original recipe a little. Then turn the heat off under the pan and let your steak rest in the pan for another minute on each side. Then, add grass fed butter, like Kerrygold, on top of the steak, and cover with aluminum foil and let it rest for 8 minutes. Anya Fernald says to put the steak on the cutting board and, invert the cast-iron pan over the steaks, and let rest for 10 minutes. But I don't want to invert a greasy hot cast iron pan on my cutting board so I just let the steaks rest on the cast-iron pan for 8 minutes. Disclaimer: I received a copy of Home Cooked from Blogging for Books because I wanted to review it. My opinions are my own, however, as this steak.